That’s pretty damning for a tablet as expensive as the $799 iPad Pro (2018). As you can see in the video below, the device’s weak points seem to be the microphone on the left side and the plastic wireless charging dock for the new Apple Pencil on the right. Both points are centrally located, making the bending process even easier. Nelson claims the iPad Pro’s thin glass panel and loose, pouch-style lithium-ion batteries don’t help out structurally. According to him, the tablet is a thin, ridge-less aluminum sack with no structure holding things together, comparing it to tin foil wrapped around mashed potatoes. 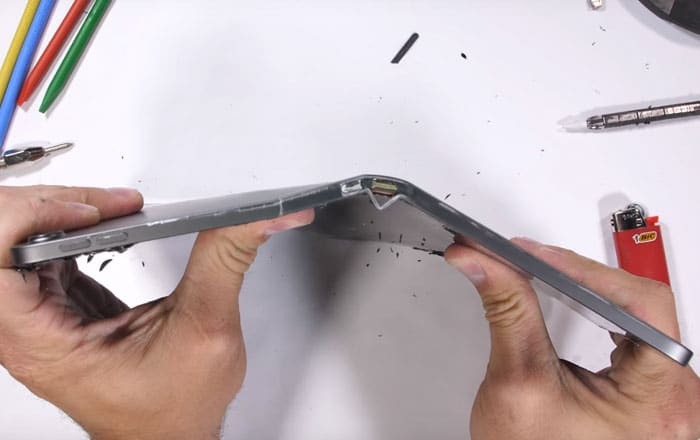 iPad Pro (2018): Bendgate 2.0? The YouTuber goes as far as to accuse Apple of trying to make the thinnest iPad possible without putting much thought into structure or weak points in the frame. It’s hard to believe a company as big as Apple would make the same mistake twice, but the evidence can’t be ignored. The Verge actually found some references to iPad Pro bending on two MacRumors forums, but those posts have since been deleted. People apparently complained about it folding straight of the box and after it was carried around in a backpack. The iPad Pro (2018) is too big for pockets, but it might be in danger inside a bag or just lying on a couch. One accident could permanently twist it out of shape. It also appears to scratch easily, both on the glass front and aluminum back, so keep it away from sharp objects.